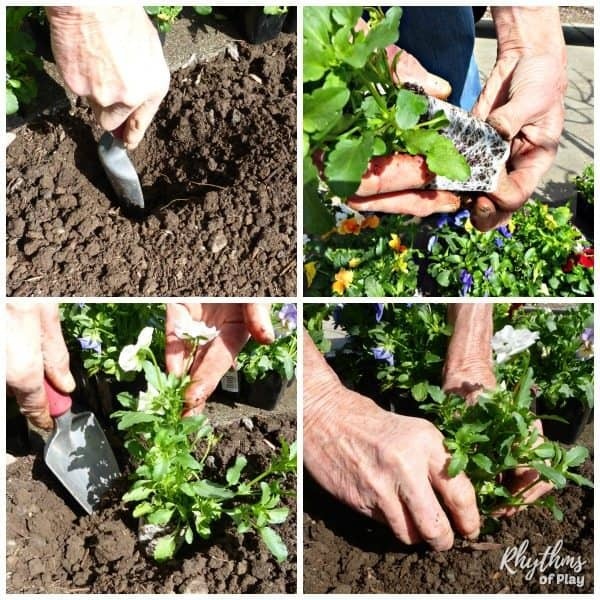 Learn what you need to plant flowers, how to prepare a garden bed, and how to plant flowers in the ground with the step by step spring flower tutorial. Also includes easy tips for parents to teach children how to garden. Gardening with kids is a great way to spend time connecting with your children teaching them the basics of plant care. 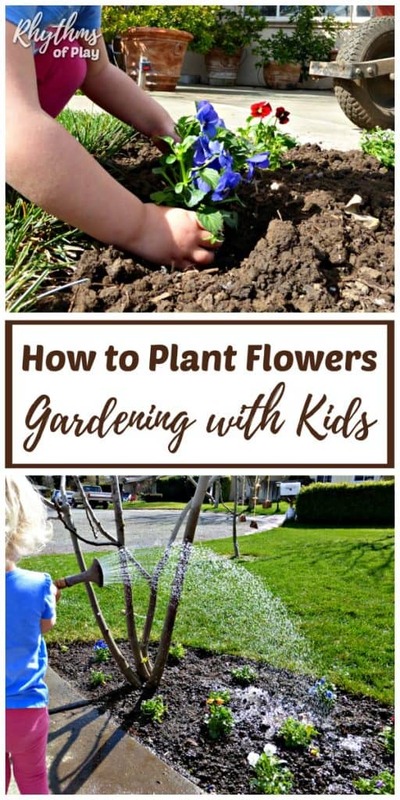 Learn how to get children in the garden helping and teach them how to plant flowers with the easy step by step spring flower organic gardening tutorial! What do you need to plant flowers? You will need gardening tools, flowers, potting soil, and containers, pots or a garden bed to plant in. The exact supplies you need will depend on where you want to plant your flowers, the type of flowers that you want to plant, and, if you will be using organic soil amendments instead of synthetic fertilizers. Dirt is dead while the soil is alive and rich in nutrients. It is important to add amendments to the soil so that it has enough nutrients in it to grow flowers. Miracle grow is not organic. It is a synthetic fertilizer made with chemicals that we choose not to use. We use the following organic soil amendments instead. Sulfur pellets/granules for soil that is too alkaline (high pH). You need to address the pH of your soil because plants can not take up nutrients they need unless the soil is in the proper range. If the soil is too alkaline your flowers will not grow well. You can pick up these organic gardening supplies at your favorite local nursery. They are just as easy to use as chemical fertilizers, and, are so much better for your plants, and our earth. Start your own flower seeds in advance, or, pick up flower starts from your favorite local nursery to plant. My daughter and I are fortunate enough to have an excellent model to learn from as far as organic gardening goes. My mother has an amazing organic permaculture garden complete with over 30 varieties of fruit trees and bushes and lots of garden beds for vegetables. 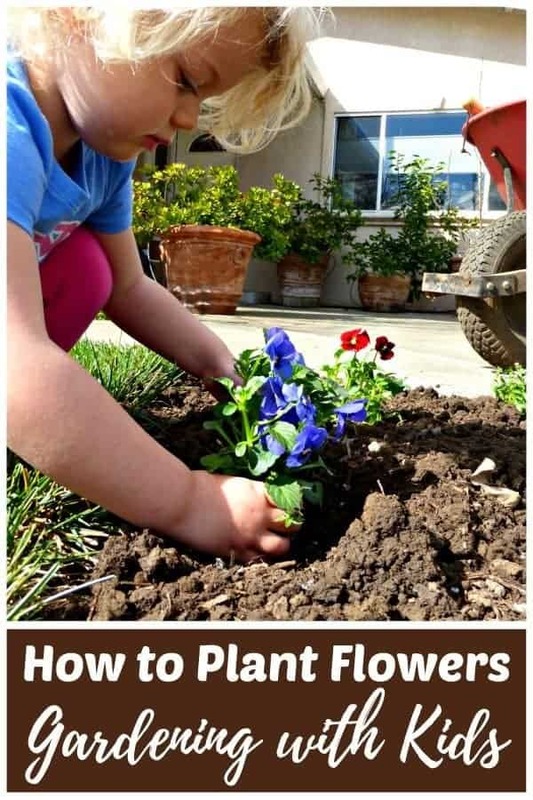 Learn how to plant flowers with your children with the step by step by step spring flower gardening tutorial she put together for us. Step by step written directions can be found below the photo tutorial. Spend some time deciding the type of flowers that you want to plant and where you will plant them. Next, get the organic gardening supplies you need at your local nursery. Don’t forget to purchase a few gardening containers or flower pots if you do not have a garden bed to plant in. Use the organic gardening supply list that we have provided above. It’s also a good idea to ask a knowledgeable staff member at your local nursery for help. Pull out weeds and use a hand cultivator , digging fork , cultivating tool , or soil tiller . You want to mix and turn the top 6-18″ of the soil. The exact digging depth will depend on the type and size of flowers that you are planting. Read the instructions that come with your flowers and ask the staff at your local nursery for help. My mother used the digging fork, I used the hand cultivator, and my daughter “helped” with a leaf rake. We modeled the work and she picked up a leaf rake to join us. Of course, a leaf rake is not an effective tool for cultivating a garden bed. It was the imitative action that was important for my 2-year-old at this stage in her learning. Using a real cultivator would have been too tough for a toddler. Allow your children to experience success as a helper and they will be more likely to continue. What’s most important is allowing children to watch you work and inviting them to help. If they decide to help, encourage your child’s efforts and thank them for helping. For more tips check out 15 ways to raise a helper. We added a generous sprinkling of bone meal , blood meal , and sulfur pellets to the soil in our garden bed. Add a generous amount of homemade compost and/or organic gardening soil to your flower bed (or container) and use your garden rake and/or cultivators to mix it in. Make room and allow your children to help. They just might push you out of the way. Make it look fun and they are sure to take away your tools screeching, “I want to do it” like our daughter did–lol! Speaking of tools. Tools are magical objects for children. If you want your children to help out more around the house and garden give them their own tools. Give this job to the kids. Playing in the dirt is a great sensory activity for the developing child. Children love to break up large dirt clods in a flower bed with their hands before planting. This simple step by step flower planting tutorial will help you get started. Dig a small hole with a gardening trowel. Cover the root ball with dirt and tuck it in. To tuck the flower in, gently press the plant down into the earth. Repeat until you are finished planting flowers. I felt like a proud mama when my daughter grabbed a trowel and began digging a hole after she watched my mother plant the first flower. Her grandmother made it look so fun she couldn’t wait to get her hands on the trowel. Water the flowers in order to finish planting them. This is a great job for the kids. Children love to help with watering! Pssst… Don’t tell your children to water the flowers. That’s the quickest way to lose your little helper! Place weeds in your compost or green bin, clean tools right away, and then put them away. Teach children that planting is not finished until all of the gardening tools are cleaned and put away. Good gardening habits start young! Young children are naturally imitative creatures. They learn best by watching others as opposed to being told what to do. The best way to teach children how to garden is to allow them to watch you and invite them to help when appropriate. Kids love to imitate the “real work” that they see the adults around them doing, and gardening is no exception. Act as a role model for how “work” is done while making room for your children to help. No pushing or cajoling or they might not ever want to join you. Simply allow your child to join in the work when they are ready. Make it look fun and exciting and your child may jump in front of you saying, “I want to do it” just like my 2.5-year-old daughter does. Your child may also decide to wander off and do their own thing instead of helping. This is as it should be. Open the space to allow them to join in whenever they felt like it. If your child decides to help, encourage their efforts and thank them for helping. For more tips check out 15 ways to raise a helper. My daughter is finally reaching the age where she helps from start to finish. The best part? She’s learning to share the work and enjoy the fruits of her labors with the rest of us… Because she wants to, not because she has to. Her favorite gardening project is her fairy garden. Click on the link to learn how to make your own! 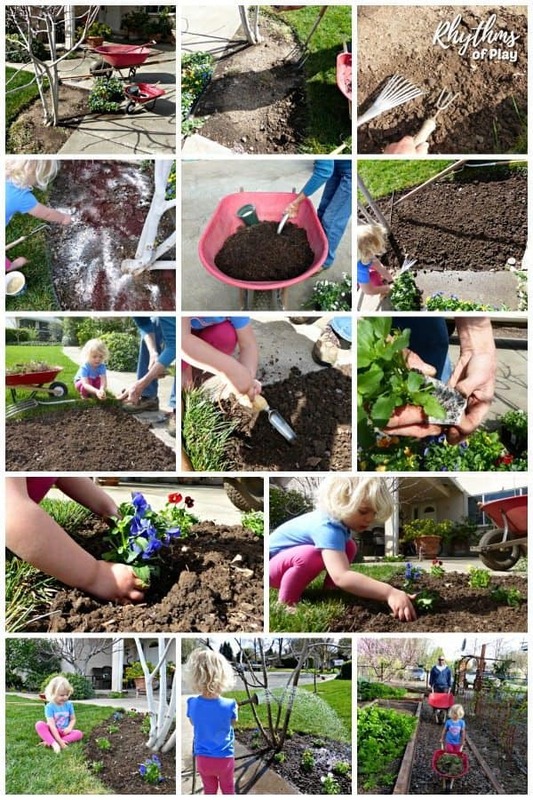 Learn how to plant organic flowers with your children with these organic gardening tips. You may also enjoy learning how to plant a tree or this collection of fun spring activities for kids. It’s always fun to have little helpers!